Stunned by the failure of his campaign to repeal Obamacare, President Donald Trump is said to be eyeing Filipinos who are key supporters of President Rodrigo Duterte for important posts on his team in Washington, DC. 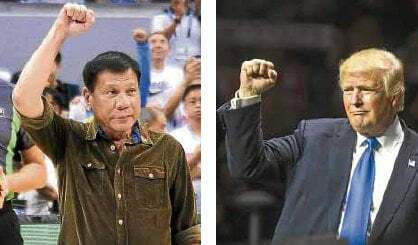 The prestigious pro-Duterte organization, the Committee for the Advancement of Creative Imagination and Systematic Institutionalization of Rodrigo’s Aspirations — better known as CACI SIRA — said the Trump Administration has reached out to prominent members of Team Duterte hoping they could help him regain his momentum. “Trump says he clearly has much to learn from what he called ‘Duterte’s impressive team,’” CACI SIRA said in a statement. Trump is a big fan of the eight-division world boxing champion who he hopes could be his point person in the U.S. Senate. “This Aguirre guy is very loyal, and he says crazy things without blinking. I like that,” Trump told CACI SIRA. Trump said he’s sure he can get Uson a slot on Fox News, maybe even her own talk show like Sean Hannitty’s.